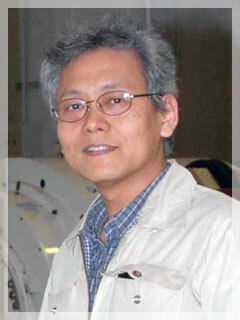 Sounding rockets of JAXA are solid propellant booster rockets developed mainly for space scientific observations and space engineering experiments. These rockets are relatively small-scale flying objects that perform various observations and experiments during ballistic flight whose maximum altitude is 150 through 1,000 kilometers. They are used for microgravity experiments and space engineering experiments such as expansion/deployment tests of large-scale structures, as well as for scientific observations such as astronomical and upper atmosphere observations. They also have obtained good results in the verification of newly developed electronic devices and control systems in actual flight environments. These observation devices or experimental equipments are stored in a place called the nose cone, which is located in the top part of the rocket, and will fall into the ocean along with the vehicle body when the experiment is completed. Japan's sounding rockets are mainly launched from the Uchinoura Space Center located in the eastern-most point of the Ohsumi Peninsula, Kagoshima Prefecture. Some of the rockets were launched from the South Pole Station and Andoya Rocket Range in Norway to directly observe auroras. In the past 46 years, 400 various sized sounding rockets, including the M rockets for scientific satellite launches, have been launched from the Uchinoura Space Center. Sounding rockets are currently launched as often as twice a year. The primary appeal of sounding rocket activities is that we can use them for experiments (and obtain results from them) in a short period of time after the experiment is approved. These experiments are chosen once a year from various applications from university researchers. After the experiment is selected, the design will be investigated for about a year and then a ground test, called the integration test, will be carried out to check all the functions before the actual launch of the rocket. Many researchers are not familiar with rocket and satellite projects, thus most of the time is spent on system adjustments to meet the requirements of the researchers who proposed the experiment. The joy of the researchers when a device they designed and built flies in the sky and performs as scheduled is unforgettable. The second attraction of sounding rocket activities is that young JAXA staff members are mainly behind the development of the launch vehicle's system. The staff members try to solve different kind of problems for each launch vehicle by achieving the requirements demanded by the experiment planner. I hope our staff members will utilize their skills developed in actual experiments on sounding rocket projects for larger-scale missions in the future. 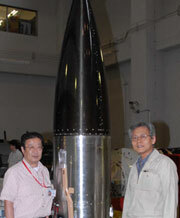 Photo: A head trunk of the observation rocket S-520-24 and Project Manager Mr. Ishii (right) during the integration and test. Mr. Yuji Yoshida, Assistant Manager (left).